The Vietnamese dong has remained stable against the dollar since the start of the year on the back of improving global risk sentiment, according to a unit of Fitch Group. Fitch Solutions predicts monetary policy and banking liquidity will remain loose in Vietnam as seen by high levels of credit growth, around 17 per cent. Fitch Solutions Macro Research, a unit of Fitch Group, has recently released a report highlighting three factors relating to continued currency stability over the short-term. Firstly, Vietnam is set to remain a regional growth outperformer as the Vietnamese Government actively maintains an open-door policy to trade, which is expected to enable foreign direct investment inflows to remain robust. The second one is that Vietnam runs a current account surplus, whilst its export-oriented manufacturing sector continues to power ahead. Due to this, Fitch Solutions expects the excess to remain intact at around 2.1 per cent of the country’s gross domestic product (GDP) in 2019. Indeed, Vietnam recorded a US$6.8 billion goods trade surplus in 2018 as goods exports grew by 13.2 per cent, a faster increase than imports which expanded by 11.1 per cent. And finally, the State Bank of Vietnam (SBV) has ample foreign currency reserves and advocates a policy of active intervention and stability. This suggests the dong likely see minimal volatility over the coming months. Over the longer-term, Fitch Solutions expects the Vietnamese dong (VND) to gradually weaken against the US dollar due to higher inflation. However, a stronger growth outlook is likely to put a floor under the depreciation of the currency. Therefore, the Fitch research unit predicts inflation in Vietnam will average around 4.1 per cent over the coming 24 months, in comparison to 2.3 per cent in the US. The higher price pressure would necessitate continuous dong weakness against the US dollar for the export sector to retain its competitiveness. 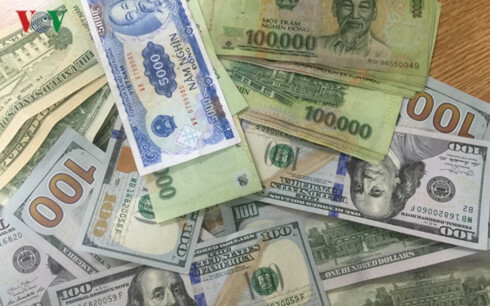 It would take the exchange rate to 23,700 VND/USD by the end of 2019, from current levels of around 23,200 VND/USD. Fitch Solutions is working under the assumption that monetary policy and banking liquidity will remain loose in Vietnam as seen by high levels of credit growth, around 17 per cent, relative to nominal GDP expansion, around 10 per cent. This is despite the fact that the private sector credit-to-GDP ratio in Vietnam already reached 130.7 per cent in 2017, which is higher than most of the nation’s peers in the region. Although the SBV has started to gradually tighten monetary policy, it continues to use credit growth targets as its primary monetary tool and Fitch Solutions highlights the pro-growth bias of the central bank. Meanwhile, the exchange rate of the VND remains expensive in comparison to its historical average. Given the tendency for valuations to revert over the long term, this is likely to act as a headwind against the VND. The Fitch research unit also claims that a re-escalation of trade tensions between the US and China, combined with increased tightening of monetary policies across the globe, could increase risk sentiment and result in the outflow of capital from emerging markets, including Vietnam. Trade uncertainty and disruptions to global value chains could also have an adverse short-term impact on Vietnam’s export sector, which could result in downside volatility on the VND.